Google Research presents a new real-time approach to object detection that exploits the efficiency of cascade classifiers with the accuracy of deep neural networks. 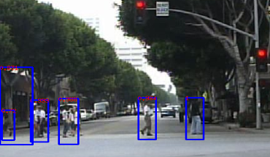 Pedestrian detectors is very important as it relates to a variety of applications including advanced driver assistance systems, or surveillance systems. The need for very high-accurate and real-time speed is crucial that can be relied on and are fast enough to run on systems with limited compute power. The research team combined a fast cascade with a cascade of deep neural networks which is both very fast, running in real-time at 67 milliseconds on GPU per image or 15 frames per second. Their approach was trained using the publicly available ‘cuda-convnet2’ code running on an NVIDIA Tesla K20 GPU.